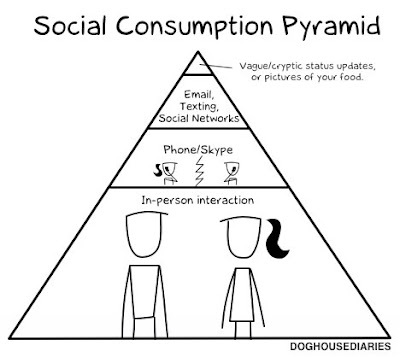 I think it was Miss Jouper who introduced me to the concept of the food pyramid. I was excited that cheese has calcium and other important nutrients because I loved cheese. It was even better to realize that pie and other desserts contain important nutrients, too. We didn't have pie at home, but we had cheese, and I loved cheese. I could eat cheese! Lots of cheese! Every day! Because it's good for me! But then Miss Jouper clarified that different foods provide different nutrients, so eating cheese (or pie, sadly) for every snack and meal is not healthy. Even good things can become fatal in excess. I enjoy keeping up with friends and family through Google+ and Facebook. We share news, send messages, show photos, express what matters to us. Email and text are usually personally addressed, which is a start. Phone conversations help with communication through tone and real-time interaction. G+ Hangouts and Skype share more of the nonverbals, which can be wonderful, or (especially in conflict) at least wonderfully helpful. Physical presence adds another dimension, both literally and figuratively. It seems you and I show up to each other more when more of us actually shows up, which in turn allows for a much more solid foundation upon which to build. Like pie or cheese, Facebook and texting provide nourishment for relationships in pleasant ways. And, also like pie and cheese, such media can take up space in the interpersonal diet that really needs to be filled by something different, more substantial, even more real. I'm looking forward to three-dimensional time this evening having dinner and conversation with people I love.